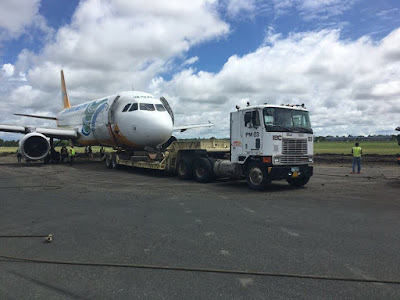 Aviation Updates Philippines - The disabled aircraft of Cebu Pacific Air at the Iloilo International Airport has already been removed, according to a new advisory released by the airline. AIRCRAFT RECOVERED. RP-C3237 is removed from the muddy area in Iloilo. Flight operations is set to resume soon. Photo by CAAP. Experts from the Civil Aviation Authority of the Philippines and the Manila International Airport Authority are working together with Cebu Pacific to completely clear up the runway from any foreign objects. Cebu Pacific flight 5J461 veered off the runway upon landing on Friday evening, October 13. An emergency evacuation was performed by the crew and all of its 180 passengers safely deplaned the aircraft. Authorities received them upon disembarkation and sent them to the airport terminal via vans. A passenger narrated that he felt the aircraft bounced thrice upon touchdown. Passengers of the flight felt a great force enough to bump their heads into the seats in front of them. The aircraft received substantial damage after it stopped in soft ground beside the runway. The nose landing gear collapsed making it hard for experts to remove the aircraft. Due to the closure of the airport, several flights have been delayed and diverted. Many passengers were affected by the closure. However, Cebu Pacific mounted recovery flights to Roxas Airport in order to pick up stranded passengers in Iloilo. The airline provided free land transfer between Roxas and Iloilo.